Today the resident pair of swans were on the fishing pond and on the long pond were three visitors, a pair and a hopeful suitor. Also attached is a shot of two competing fish eaters. The link below is of a short video taken yesterday afternoon at the feeders. We had a walk along the sands from the Black Huts to Roanhead and came across a flock of approximately 20 feeding Snow Buntings, they kept lifting and flying in front for a few yards and then start feeding again. Also attached is the photo of the Carrion Crows, which should have been with the previous post. Every day on our daily walk we see four to six Carrion Crows but today there were eighteen on top of a group of Willow trees. Last year it was early March that a group of eight met. When they dissipated it was in pairs, exactly the same as last year. Normally they travel in pairs, anyone know the reason they form a group, it normally only lasts for 15 to 20 minutes. 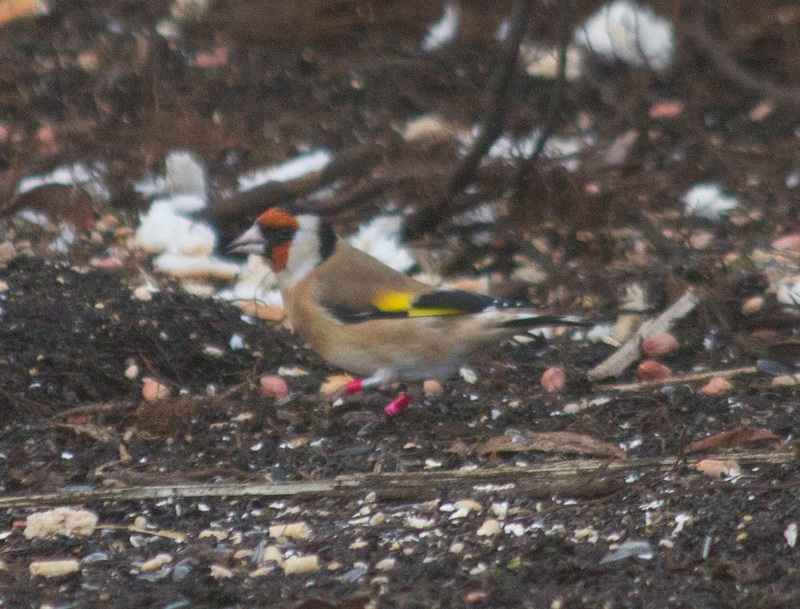 The Goldfinch with the coloured rings was taken at the feeders on the 11th Dec, the picture was sent to Colin at the South End and he confirmed it was ringed by them on the 23rd Nov and he had a report that it was in a garden in North Scale on the 6th Dec. it appears to be slowly heading north.